Lucky College Students Get Surprise Jonas Brothers Concert! | Joe Jonas, Jonas Brothers, Kevin Jonas, Nick Jonas | Just Jared Jr.
Can you even imagine going out for a fun night with your college friends and having the Jonas Brothers show up to perform a surprise concert?! Well lucky students at Penn State had that happen when the Nick, Joe, and Kevin showed up for a special performance at college bar Champs on Friday night (April 5) in State College, Penn. 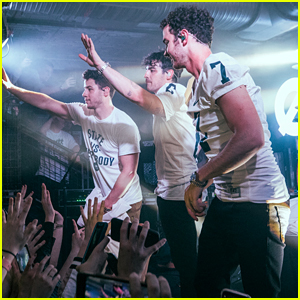 The guys performed five songs while their significant others Priyanka Chopra, Sophie Turner, and Danielle Jonas – known as the “J Sisters” – cheered them on. Penn State Football Head Coach, James Franklin, came out to support and surprised the guys and their significant others with team jerseys. “Tonight was very fun. Penn State thank you. 🆒,” Nick captioned the below photo on Instagram.